Maharashtra Mega Bharti 2019 (महाराष्ट्र मेगा भरती 2019) is announced by Government of Maharashtra. This Maharashtra Mega Bharti 2019 is going to recruit for total 72,000 posts. After getting confirmation regarding Maratha Reservation, immediately government announced about fulfilling 72000 posts Mega Bharti in 2019. Previously Maharashtra Government planned to take this Mega Bharti in 2 stages i.e in first stage 36000 posts and remaining in next process. But now as per latest news, Government will recruit 34000 vacancies in this Mega Bharti. Mega Bharti 2019 is started in all the departments of Maha Government and below you will get all the details regarding Mega Bharti. This Maharashtra Mega Bharti will be one of the biggest recruitment ever and it will cover all the departments which came under government authority. In this Mega Bharti following departments recruitment will declare under ZP Bharti 2019 – Gram Vikas Vibhag, Arogya Vibhag, Gruh Vibhag, Krushi Vibhag, Pashusanvardhan Vibhag, Sarvajanik Bandhkam Vibhag (PWD Department), Jalsampada Vibhag, Jalsandharan Vibhag, Matsya Vyavsay Vikas Vibhag, Van Vibhag (Forest Department) and Nagar Vikas Vibhag. Collection and grouping of all the vacancies in all departments of Maharashtra have been completed now. So, Maybe in the coming 3-4 days, Mega Bharti Advertise will publically available. Bombay High Court keeps stay continue over Mega Bharti till 6 February 2019. As on 6th February, the hearing has been placed regarding the issue of Maratha Reservation. In a program organized at Dhule, Chief Minister Devendra Fadnavis said that soon the Mega Bharti will be issued as there is no barrier to starting mega recruitment soon. The state government has given a guarantee that the recruitment of Maratha will not be recruited till 23 January during the hearing of the petition filed in the Bombay High Court. The state government has been challenged in the Bombay High Court for granting 16 percent reservations to government jobs and educational institutions in the Maratha community. Under the Maratha Reservation Act, all the institutions of the state government can start recruitment process in Mega Bharti process, but the government in the High Court guarantees that successful candidates will not be given the nomination till January 23. As per the latest information, Mega Bharti advertisement will be published anytime in between 17 to 19 December 2018. The government was trying to publish the advertisement on 15th December but vacancy data submission of some districts is still pending so the date is postponed to next 2-3 days. As per the latest news, In the first stage Total, 34000 posts will recruit in Mega Bharti. 302 posts will be recruit through MPSC from 12 different cadres. Mega Bharti 2019 is going to start in the first week of February 2019. In the next week, the Official advertisement will be published. Maharashtra Megabharti New Update Published on 1 December 2018. Actually, in July 2018, official confirmation regarding Maharashtra Mega Bharti is announced. But due to the ongoing issue regarding Maratha Reservation, That time the government holds this mega recruitment till the announcement of Maratha Reservation. So, now Maratha Reservation is declared and procedure regarding Mega Bharti 2018 – 2019 is started. Recruitment news will out very soon. What is the educational qualification required for Mega Bharti 2019? We know this question is currently coming in your mind as there is no clear explanation published by the government. We want to clear you one thing that, this Mega Bharti is announced for all the major government departments and separate department wise notification will publish. There are also chances of district wise notification for each department will announce because all type of vacancies is going to recruit in this Mega Bharti i.e Grade A, B, C & D.
So, Don’t worry, All the job requirements from 12th to Post Graduation will fulfill in this Mega Bharti. Final qualification details will be published on this page once official notification will release. Educational Qualification and Eligibility Criteria for Mega Bharti 2019 depend upon for which post you are applying. So, We will get all the information once the official advertisement will publicly available. Keep visiting this page as we are regularly updating information regarding Mega Bharti 2019. Now we will see detailed information about department wise posts in the Mega Bharti. Official posts data will publish in December 2019, so this data is tentative but almost accurate. This Bharti is for the Group “C” and Group “B” level government vacant posts and all exams of various departments will be taken on the same day. In these exams, 25% of the syllabus will be on History and Geography of their respective districts. So, you need to study carefully by following the actual syllabus to save your time. We provided the complete syllabus with notes in below link, you just need to click on it. Age Limit for Mega Bharti is the common question generally asked by students, so here we will provide you age limit details. Age Limit is varied with the category you belong i.e There are different age limitations by categories. We provided age limit information in the below table. Department wise posts list is given in the below Table. Please Note – खालील पदे हे मराठीतील आहे पण इंग्लिश मध्ये लिहिलेले आहे. So friends, Now increase the speed of your study as this Mega Bharti is going to start very soon. Do preparation well and be confident, Success will be in your feet. 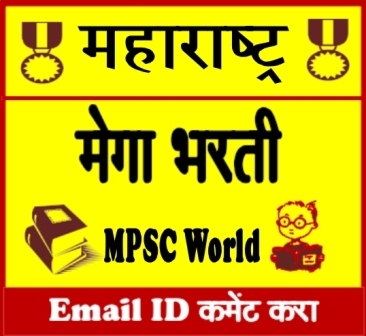 Keep Visiting MPSC World to get the latest updates about Mega Bharti 2019. I please reqared to job. Sir St mahamandal (msrtc) chya 6949 jagechya bharti vishayi mahiti dyal ka	?? Please please…!! please upload 9th and 10th class books. Month madhe bharti hoil ka?? Election sathi fkt bharti kadli nahi na? Government change jhal tr bharti process continued hoil ka?? Sir..,what is qualification for krushi vibhag.? please,pashuswarndhan vibhag bharati news kadi yenar?